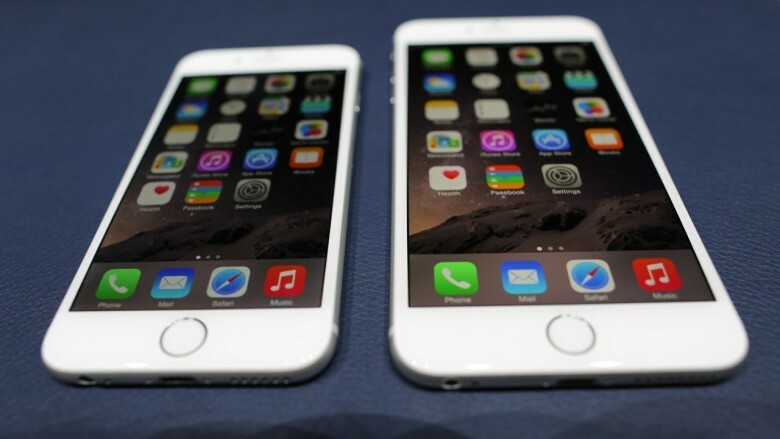 As expected, the new iPhone 6 and iPhone 6 Plus offer more screen space, with 4.7-inch and 5.5-inch screens respectively. Apple has pulled off a major engineering miracle: they’re also thinner, faster and smarter than their older cousins — and you don’t have to be richer to get your hands on one. You’ll also be able to use these phones as wallets and health trackers, marking a huge advance in how smart our phones really are. When Tim Cook started off the keynote by saying “Today, we are pleased to announce the biggest advancement in iPhone,” we were slightly wary of the hyperbole as journalists should be. But after getting a good look at the two new iPhones, we couldn’t agree with him more. The latest marvels to come out of Cupertino have got more pixels and sharper displays than previous iPhones — the iPhone 6 has 38 percent more pixels and the iPhone 6 Plus has 185 percent more pixels than previous models. They’ll also bulk out your stovepipe jeans less: they’re thinner than previous models, coming in at 6.9 and 7.1 mm respectively. The contrast is higher and text is sharper so that it displays more than before. Cameras also got a major makeover: a new 8MP iSight camera with f/2.2 aperture and all-new sensor featuring “focus pixels,” and phase detection auto focus (twice as fast as previously). All of this adds up to “even more incredible photos,” Phil Schiller said from the stage The front camera features a FaceTime HD camera with a 2.2/f aperture plus Apple’s improved Face Detection, and a selfie burst mode. The cameras on the iPhone 6 and 6 Plus are also getting big upgrades today with 8MP iSight camera with f/2.2 aperture and all-new sensor. A new tech called “Focus Pixels” is included in the sensor that reads light from objects and provides phase detection autofocus that you can find on many DSLRS, offering twice as fast focusing over the iPhone 5s. Panoramas can stretch up to 43 megapixels in size. There’s better tone mapping and advanced noise reduction, too. 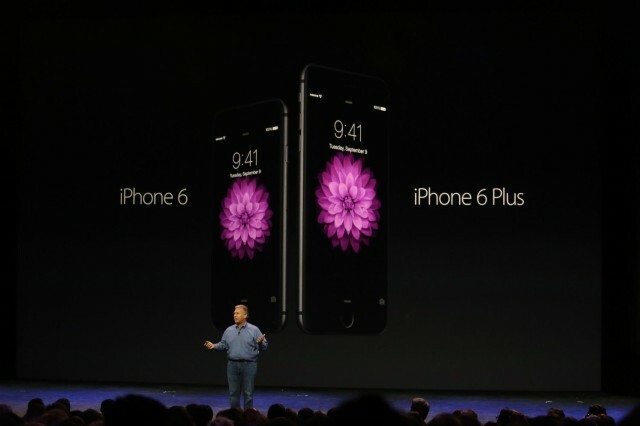 The iPhone 6 can handle LTE speeds of up to 150mbps down. It also supports faster 802.11c WiFi, higher-quality Voice Over LTE calls, and a new feature Apple is calling WiFi Calling – so when you’re, you know, holding the phone wrong and there’s bad reception, you can start out the call with WiFi and carry on seamlessly. It also features an M8 processor that now estimate distance, steps, and elevation to tell how many flights of steps you’ve been walking up. The iPhone 6’s new barometer sensor will be included in the Health app, and developers can take advantage of it as well. These features will integrate perfectly with the Apple Watch. NFC is used to wirelessly pay for things in the iPhone 6 and 6 Plus. Touch ID is used to authenticate, and there’s a new “Secure Element” in the iPhone to store your financial data. Financial credentials are randomized for each transaction, so identity theft is basically impossible. But the price for all that new-fangled goodness is what had the crowd erupting in cheers. The iPhone 6 starts at 16GB for $199, $299 for 64GB and $399 for 128GB.The iPhone 6 Plus is $100 more at each storage size — and note that Apple killed the 32GB model. The iPhone 6+ will set you back 16GB $299, 64GB $399 and 128GB $499. They come in silver, gold and space grey. Pre- orders start September 12th and shipping begins September 19 in the U.S. and eight other countries.